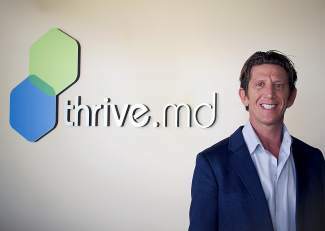 Dr. Scott Brandt, M.D., poses at his practice, ThriveMD in Edwards. About two years ago Brandt began utlizing adult stem cells harvested from fat reserves to treat patients with chronic or acute joint pain. He is scheduled to speak Wednesday at Colorado Mountain College in Breckenridge about the future of stem cells for regenerative medicine. — The event, presented as part of CMC’s speaker series, is free and open to the public. To RSVP, visit www.ColoradoMtn.edu/SummitCE. A Vail Valley doctor who is using human stem cells as an alternative to invasive reconstructive surgery is scheduled to speak Wednesday, April 2 at Colorado Mountain College in Breckenridge. Dr. Scott Brandt, M.D., of ThriveMD in Edwards, began employing about two years the natural regenerative benefits of stem cells for patients with acute and chronic pain in their knees, shoulders, wrists, ankles, hands, feet, hips, elbows and certain spinal conditions. On Wednesday, Brandt will present “The Future of Medicine is Now: How Regenerative Medicine Can Restore Physical Function & Performance” as part of CMC’s speaker series. The event takes place from 7 to 8:30 p.m. at the Eileen and Paul Finkel Auditorium, 107 Denison Placer Road in Breckenridge. Brandt said Monday, March 31 that he has treated about 400 patients since opening ThriveMD, providing him with a wealth of data about not only the positive effects of stem cells for regenerative medicine, but also how stem cells may be used beyond repairing bone, cartilage, ligaments and tendons. In July 2013, Brandt said he felt strongly that the best stem cells for regenerative medicine were harvested from fat. He has since expanded the treatment to include a mixed biologic of fat- and bone marrow-derived stem cells, as well as platelet rich plasma. Back in July 2013, Brandt said he believed stem cells might one day be used as a treatment for degenerative diseases. On Wednesday, he’ll discuss how the new triple biologic may bring the medical industry one step closer to using stem cells to treat diseases like chronic obstructive pulmonary disease, Type 2 diabetes and multiple sclerosis. Wednesday’s CMC speaker series is free and open to the public. The Eileen and Paul Finkel Auditorium holds 228 people. For more information and to RSVP, visit http://www.ColoradoMtn.edu/SummitCE.